Discover the amazing benefits of Dr Teal's Pure Epsom Salt whole body soaks. Dr Teal's Relax &amp; Relief combines Pure Epsom Salt with Eucalyptus &amp; Spearmint essential oils to relax and restore the body, revive the spirit and relieve your achy muscles and feet. Discover the amazing benefits of Dr Teal's Pure Epsom Salt whole body soaks. Dr Teal's Relax & Relief combines Pure Epsom Salt with Eucalyptus & Spearmint essential oils to relax and restore the body, revive the spirit and relieve your achy muscles and feet. Stop Use Indications: Caution: Hot or warm soaks should not be used by individuals with diabetes, except on advice of physician. For external use only. Do not ingest. Use only as directed. Keep out of the reach of children. If irritation occurs, discontinue use. Consult a physician if irritation persists.For external use only do not ingest. Caution: Hot or warm soaks should not be used by individuals with diabetes, except on advice of physician. For external use only. Do not ingest. Use only as directed. Keep out of reach of children. If irritation occurs, discontinue use. Consult a physician if irritation persists. For external use only. Do not ingest. Ingredients: Magnesium Sulfate (Epsom Salt), Fragrance (Parfum), Eucalyptus Globulus (Eucalyptus) Leaf Oil, Mentha Viridis (Spearmint) Leaf Oil, Benzyl Benzoate, Benzyl Salicylate, Limonene, Linalool. Instructions: How to use: Soak away sore muscles: Pour at least 2 cups of Dr Teal's Epsom salt under warm, running bath water. Soak for 20 minutes, and let the rich minerals absorb through the skin, offering relief to sore muscles. Exfoliate your skin: Mix a handful of Dr Teal's Epsom salt with a handful of your favorite body wash. Gently massage mixture onto skin to slough away dry patches, revealing a healthier-looking complexion. Relieve sprains and stings: Add 1 cup of Dr Teal's Epsom salt to 1 quart of warm water. Immerse a wash cloth in the solution, then wring out excess water. Apply the warm wash cloth to the affected area until the wash cloth is no longer warm. Repeat two or three times to help reduce pain and swelling. I have been a long time believer in the healing power of epsom salt. I bathe in it every other day. I also love the fragrance of eucalyptus and spearmint combined with steam and how it really opens up your sinuses and helps undo some of the harsh effects of cold winter air. I find this bath so therapeutic for mind and body, and I even notice that my little boy is more relaxed after bathing in it with me. I know its not a childrens product, but since there really isn't any medicines that babies can take for colds and stuffy noses, this is really a lifesaver when he has a cold because it clears his head up and soothes ad relaxes him to help him get to sleep. I highly recommnd this product! This stuff is magic! Just put a cup in the bathtub and get in. The scent clears your head and relaxes you. The Epsom Salt eases all the aches and pains away. Walmart has a great price, and ordering online is very convenient because this is almost impossible to find in a store. My wife says it really does the job for her aching lower back and legs. I bought 6 bags just so I wouldn't have to run out so often. Walmart online pricing was the best I found if you can place an order to get the free shipping. Do you wanna relax and feel soooooooooooo rejuvenated ?? Dr.Teal's out did This gracious soak , I just can't get enough of it...Gonna soak now ,you'll be as surprised as I am !!!!!! 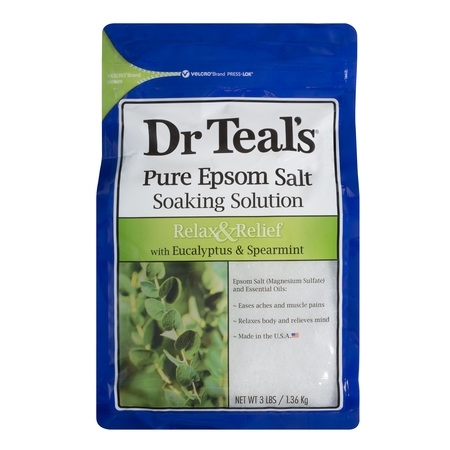 First time trying this version of Dr Teal's epsom salts and it's very good as I expected it would be. Personally I still prefer the lavender sent but this is very nice.